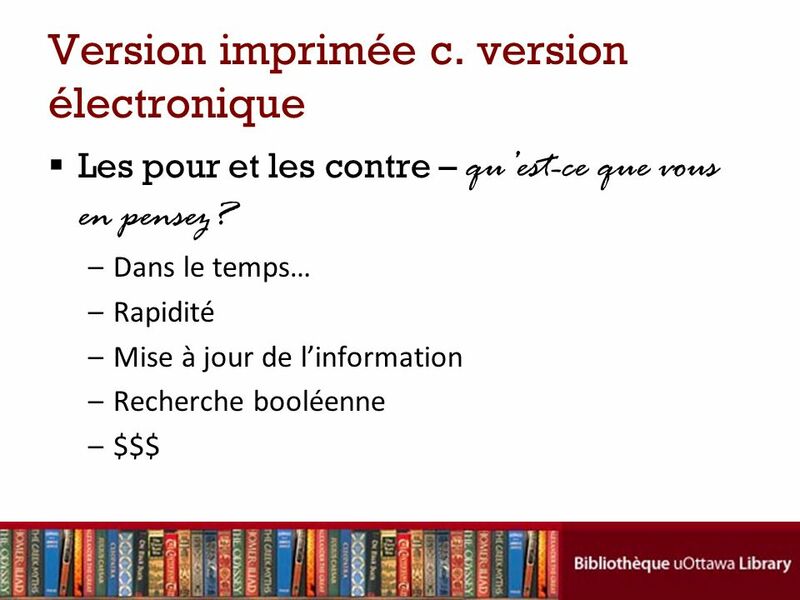 2 Plan du cours Introduction au cours et qui suis-je? 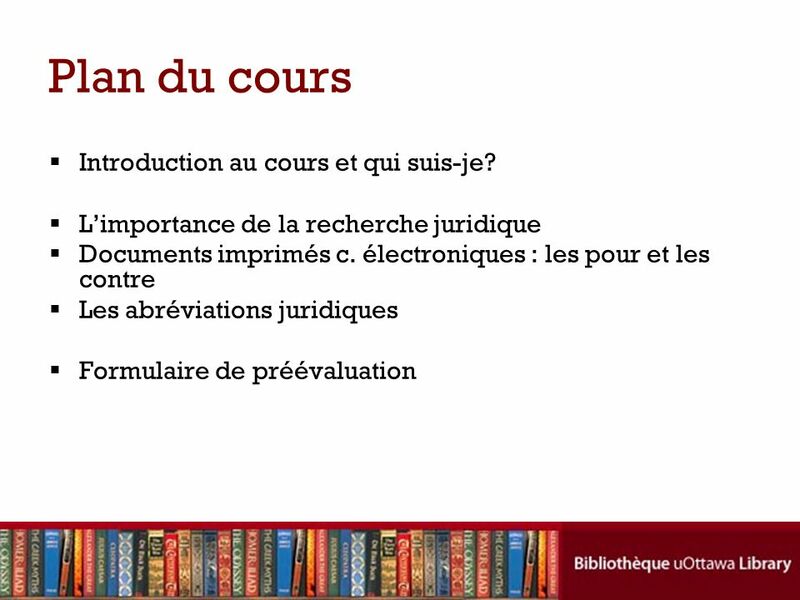 4 Pourquoi ce cours est-il important? 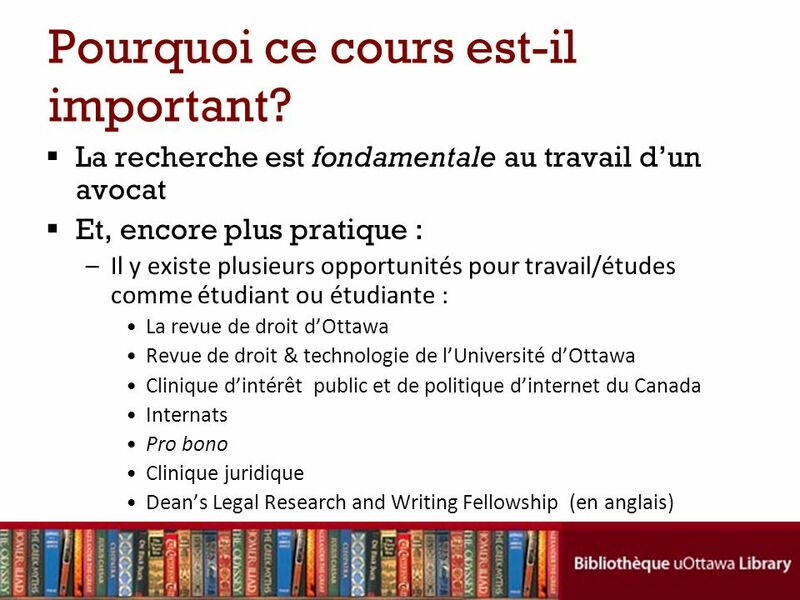 La recherche est fondamentale au travail d’un avocat Et, encore plus pratique : Il y existe plusieurs opportunités pour travail/études comme étudiant ou étudiante : La revue de droit d’Ottawa Revue de droit & technologie de l’Université d’Ottawa Clinique d’intérêt public et de politique d’internet du Canada Internats Pro bono Clinique juridique Dean’s Legal Research and Writing Fellowship (en anglais) Answers from one of my students after completion of 1st year: -why do you think legal research instruction is important? 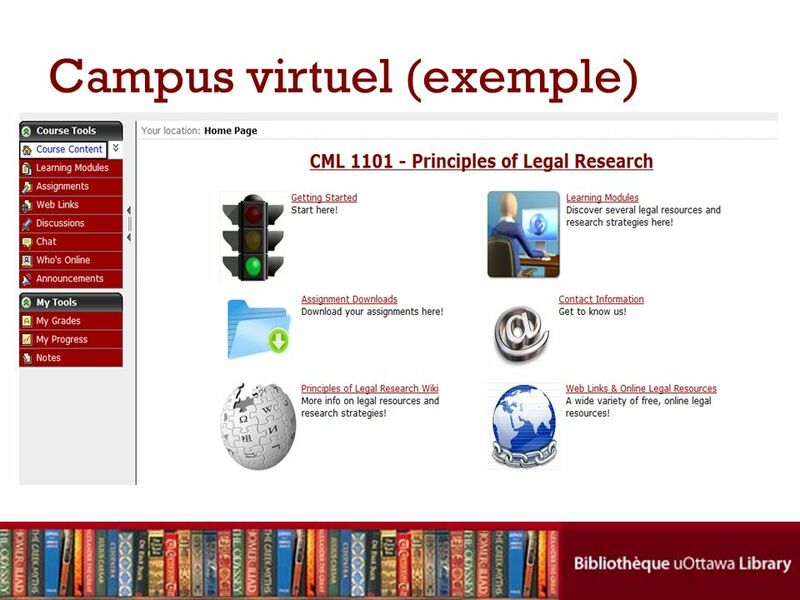 Legal research instruction was important to me because coming into law school I had no idea how cases were documented and stored, or where to find scholarly legal articles. 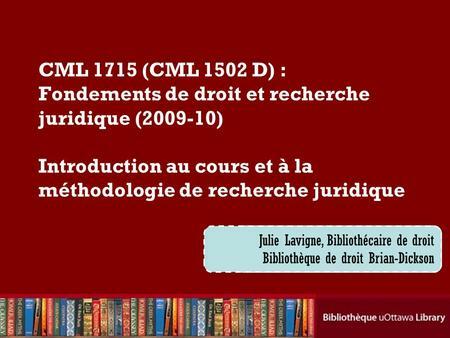 The legal research course introduced me to legal research concepts, taught me what was out there and where to find it. -how has legal research training helped you throughout your first year? The legal research training helped me research and write my papers for my small group, and also helped me complete citation assignments in my small group. It also helped me gain a position on the Law Review; the application includes a citation exercise that I wouldn't have been able to complete without the legal research training. 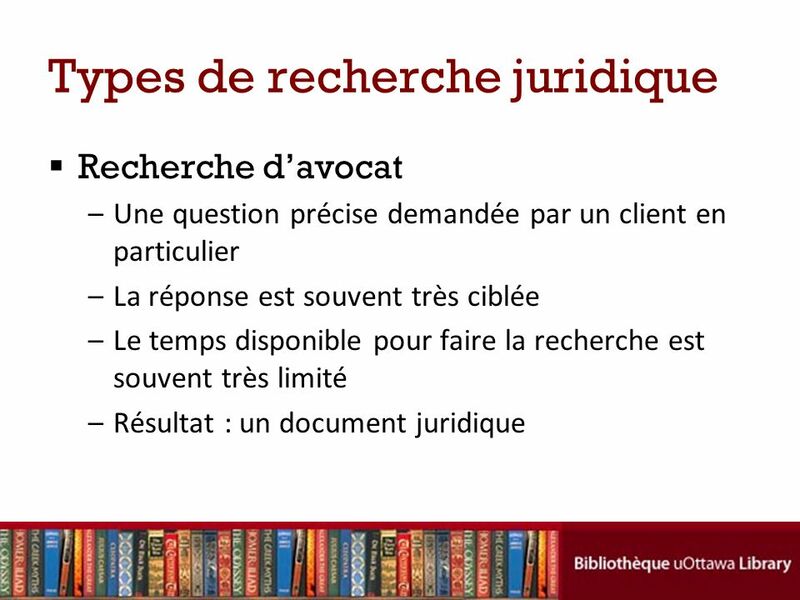 -how has legal research training helped you after first year (e.g. RA position, summer articling, etc.) In addition to gaining a position on the Law Review, the legal research training helped me in work as an RA. I was hired as an RA for one of my professors during my second semester of first year and also during the summer after first year. 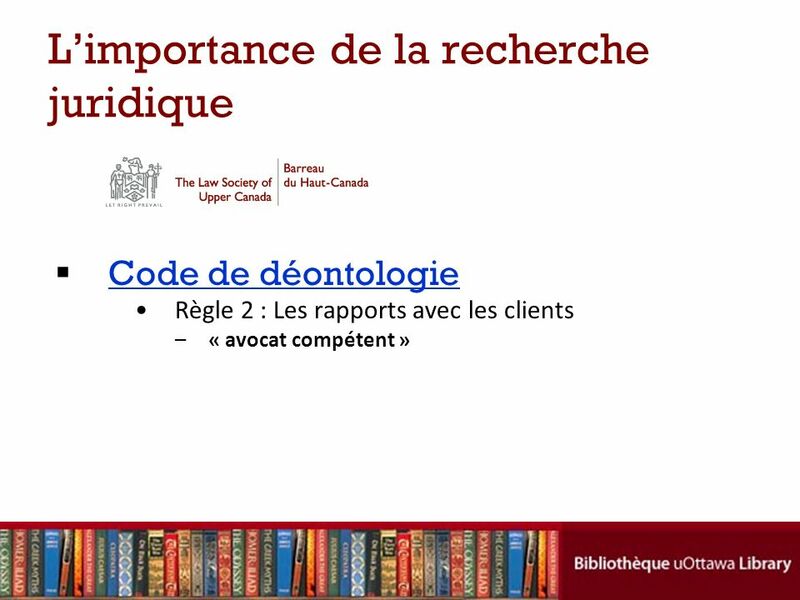 The legal research instruction gave me the confidence and ability to effectively research in the role. 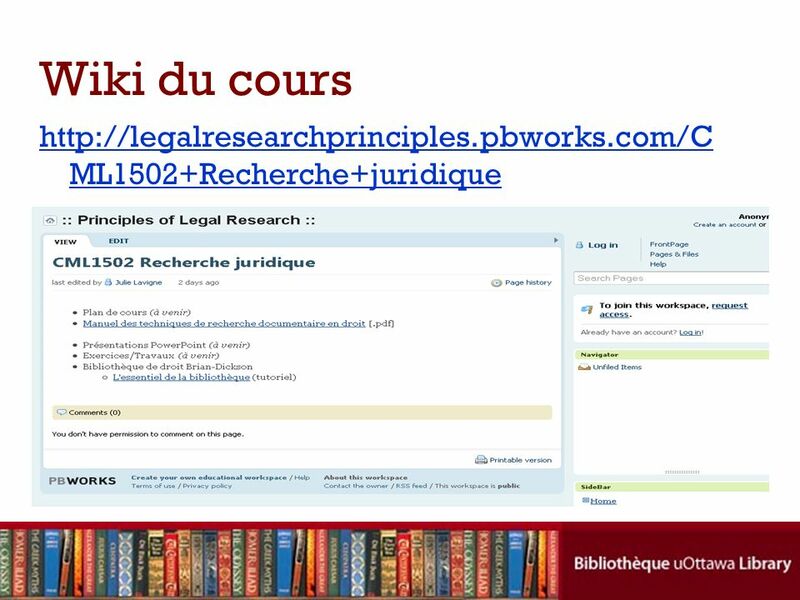 Because of the legal research instruction, I was able to get right down to the research without having to familiarize myself with the research tools on top of conducting the research itself. L’approche Google (Eureka!) 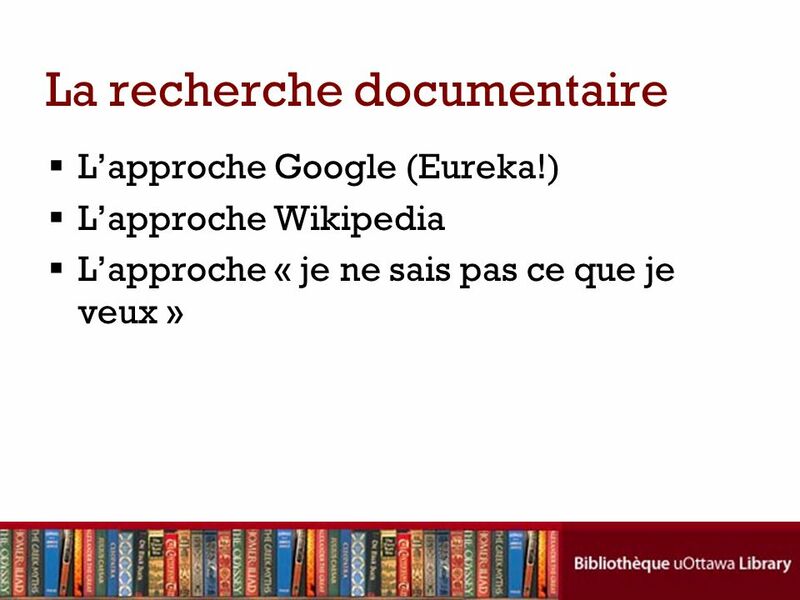 L’approche Wikipedia L’approche « je ne sais pas ce que je veux » Google approach: eureka! I found exactly what I was looking for; thank you, Google. Satisfaction very high! But REAL frustration if it’s not there. General info approach: I just want to know what the heck they’re talking about. No specifics, I don’t care if it’s right or if there are a couple of errors in it. Satisfaction average. I don’t know what I need: Satisfaction not so high. Satisfaction higher IF you have more knowledge about sources. Sources primaires —	des déclarations juridiques provenant des autorités législatives ou judiciaires décisions judiciaires ou administratives législation en vigueur (lois, règlements, codes, etc.) 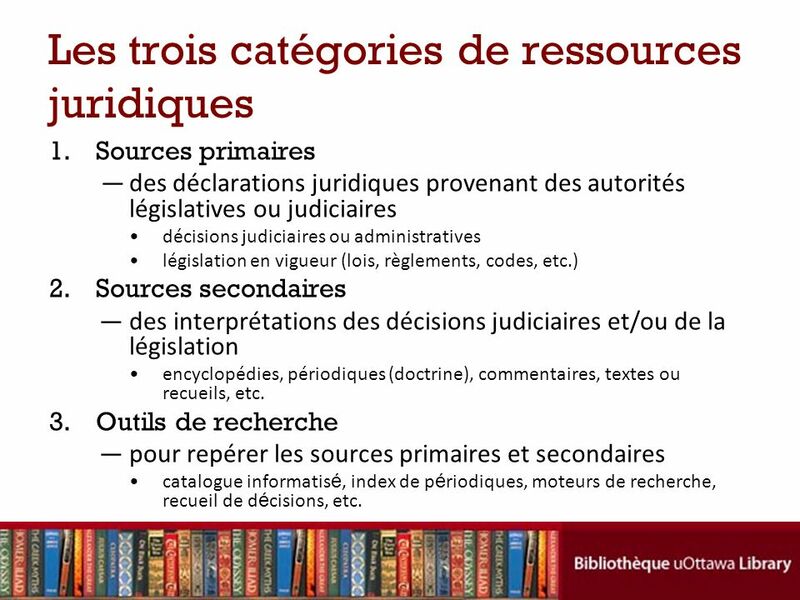 Sources secondaires — des interprétations des décisions judiciaires et/ou de la législation encyclopédies, périodiques (doctrine), commentaires, textes ou recueils, etc. 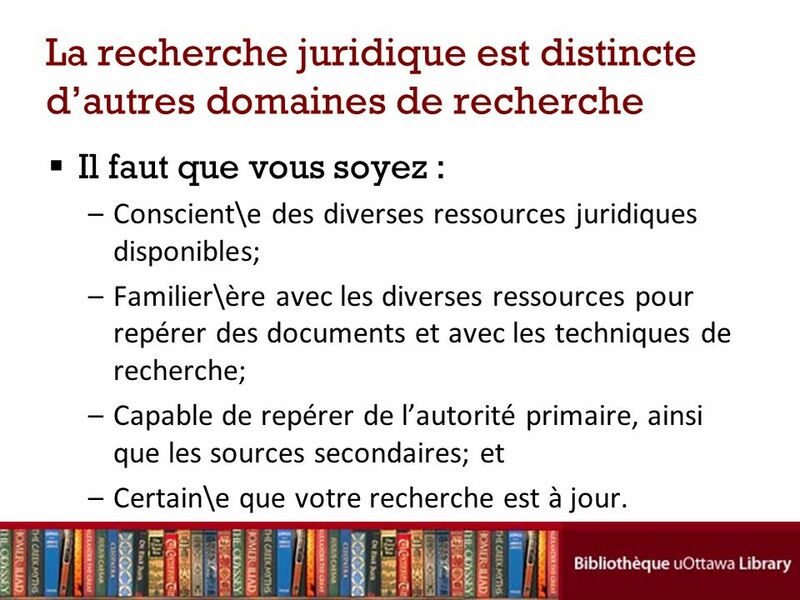 Outils de recherche — pour repérer les sources primaires et secondaires catalogue informatisé, index de périodiques, moteurs de recherche, recueil de décisions, etc. 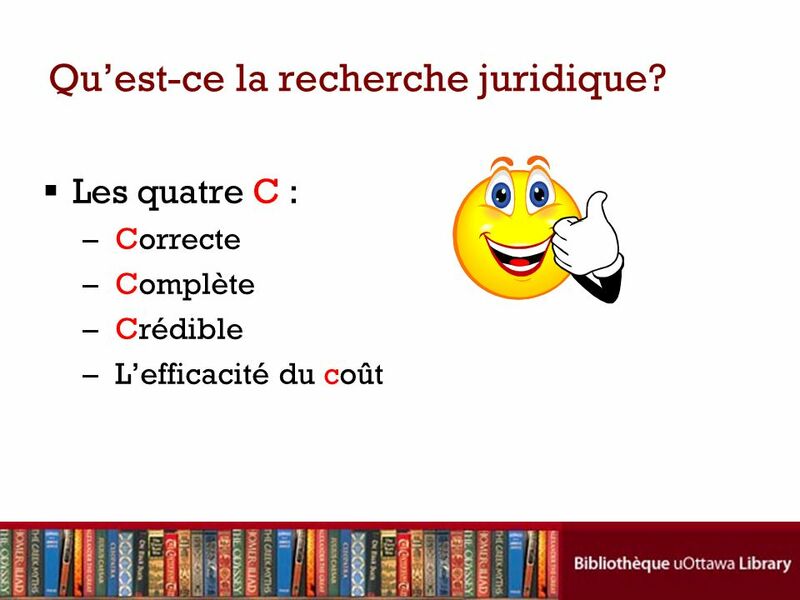 18 Qu’est-ce la recherche juridique? 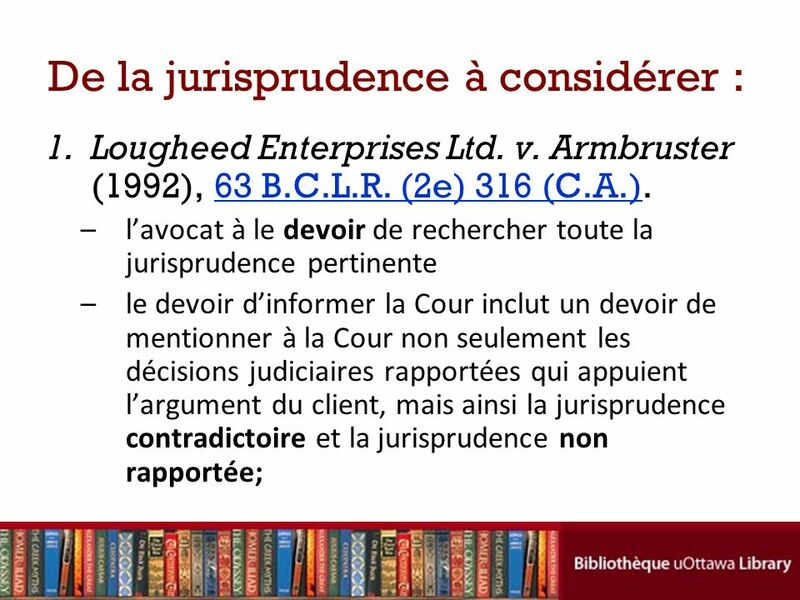 Analysis/Application of law to facts Communication Voir Maureen Fitzgerald, Legal Problem Solving: Reasoning, Research and Writing, 3e éd., Toronto, Butterworths, 2004 aux pages 2 à 4. Based on the first letter of each of the steps; as described by Maureen Fitzgerald in Legal Problem Solving: Reasoning, Research and Writing, 3d ed. (Toronto: Butterworths, 2004) at 2-4. 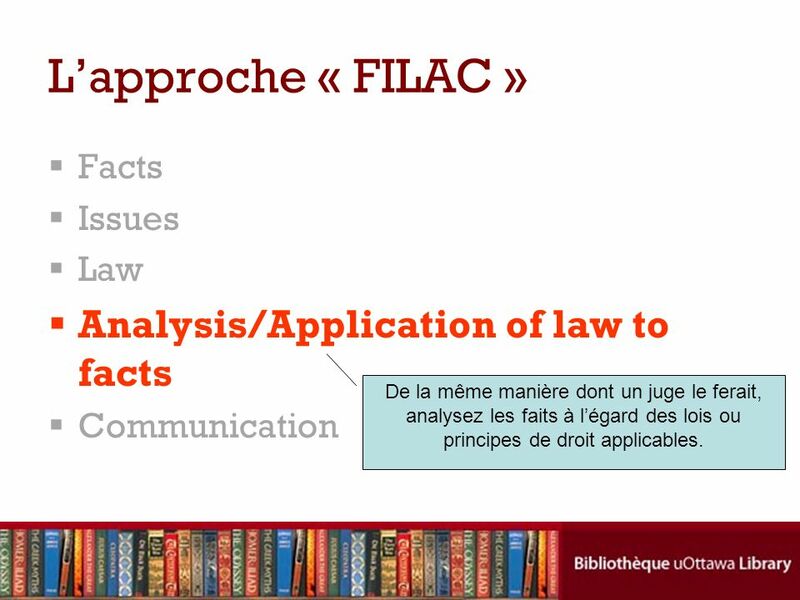 A similar legal research model: Analyze the facts and formulate a preliminary statement of issues. This is a continuous process. Be prepared to re-frame the issue(s) as your research progresses. Familiarize yourself with the court structure of the jurisdiction. It may be necessary to do background research to determine whether provincial or federal law applies. Conduct background research to get an overview of the subject area, identify issues and terms, and get clues to primary sources. Learn the types of authority involved, i.e. whether the issues are governed by case law, statutory law, administrative law or a combination. You may need to learn some of the “black letter law” to gain a context for your research. Secondary sources can be useful for this purpose. Search for legal authority using appropriate methods of updating. There are many different techniques for finding primary authorities. For any given research project, some will work better than others. Using a variety of tools will ensure comprehensive research and compensate for difficulties that one may encounter in using particular sources. Always look for pocket parts and other supplements when using print sources. Note the dates of coverage in all electronic sources consulted. Read and evaluate primary authorities. Never overlook the importance of reading cases and other authorities as you go along. Do not substitute reading of the headnotes, synopses or interpretations in secondary sources for your own thoughtful reading of the authorities you find. Look for holdings of cases, not just broad statements of the law. Make sure cases are still good law and you have the current version of statutes. Time can often be saved by using case validation tools (citators) as soon as you read a case and determine that it is relevant to your issue. Make sure you have checked all available supplements if using print sources. Look up statutes in electronic form to check for recent amendments. Refine analysis and formulate conclusion. Returning to secondary sources near the end of a research project can be helpful. These sources can be easier to understand after you have read some of the primary authorities. Bien déterminer les faits pertinents. Mais que fais-je si je ne sais rien sur le sujet??? 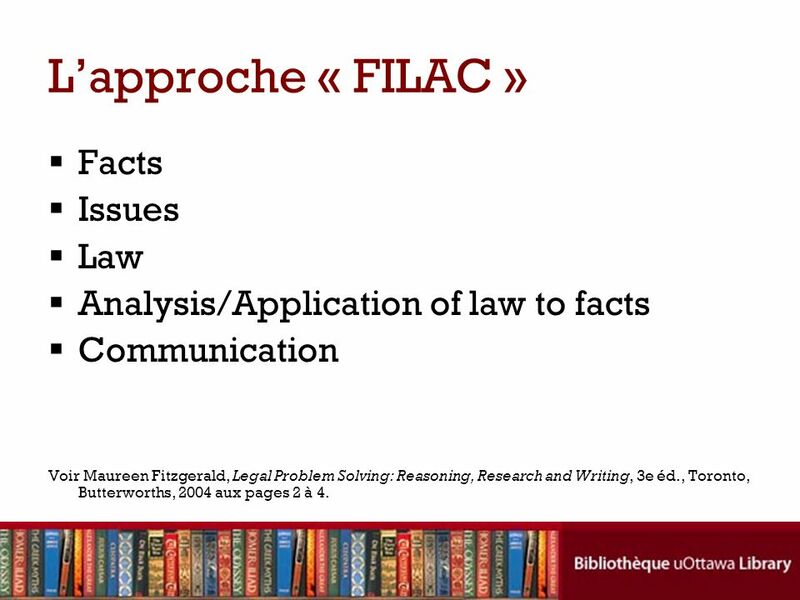 Facts Issues Law Analysis/Application of law to facts Communication Based on the first letter of each of the steps; as described by Maureen Fitzgerald in Legal Problem Solving: Reasoning, Research and Writing, 3d ed. (Toronto: Butterworths, 2004) at 2-4. A similar legal research model: Analyze the facts and formulate a preliminary statement of issues. This is a continuous process. Be prepared to re-frame the issue(s) as your research progresses. Familiarize yourself with the court structure of the jurisdiction. It may be necessary to do background research to determine whether provincial or federal law applies. Conduct background research to get an overview of the subject area, identify issues and terms, and get clues to primary sources. Learn the types of authority involved, i.e. whether the issues are governed by case law, statutory law, administrative law or a combination. You may need to learn some of the “black letter law” to gain a context for your research. Secondary sources can be useful for this purpose. Search for legal authority using appropriate methods of updating. There are many different techniques for finding primary authorities. For any given research project, some will work better than others. Using a variety of tools will ensure comprehensive research and compensate for difficulties that one may encounter in using particular sources. Always look for pocket parts and other supplements when using print sources. Note the dates of coverage in all electronic sources consulted. Read and evaluate primary authorities. Never overlook the importance of reading cases and other authorities as you go along. Do not substitute reading of the headnotes, synopses or interpretations in secondary sources for your own thoughtful reading of the authorities you find. Look for holdings of cases, not just broad statements of the law. Make sure cases are still good law and you have the current version of statutes. Time can often be saved by using case validation tools (citators) as soon as you read a case and determine that it is relevant to your issue. Make sure you have checked all available supplements if using print sources. Look up statutes in electronic form to check for recent amendments. Refine analysis and formulate conclusion. Returning to secondary sources near the end of a research project can be helpful. These sources can be easier to understand after you have read some of the primary authorities. 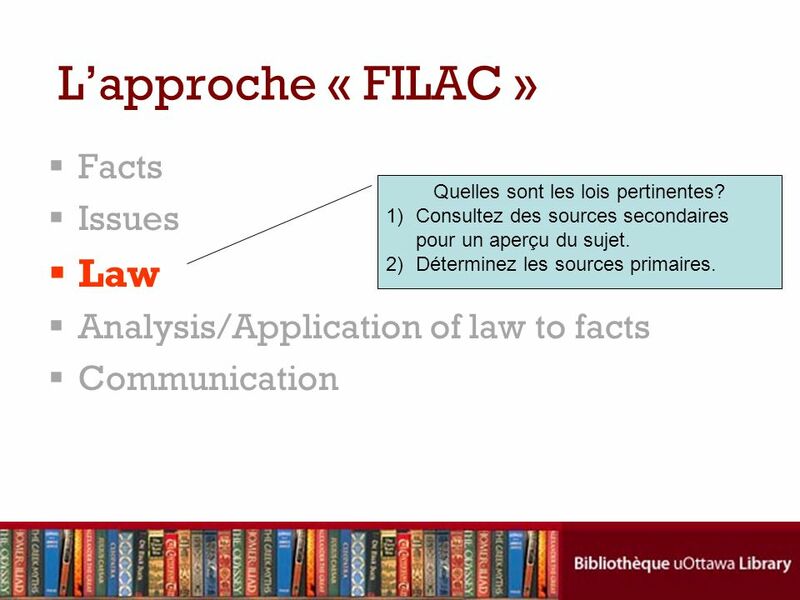 Analysis/Application of law to facts Communication Bien déterminer les sujets pertinents à rechercher. Ceux-ci seront basés sur les faits. Notez-les comme des questions auxquelles il faut répondre. Based on the first letter of each of the steps; as described by Maureen Fitzgerald in Legal Problem Solving: Reasoning, Research and Writing, 3d ed. (Toronto: Butterworths, 2004) at 2-4. A similar legal research model: Analyze the facts and formulate a preliminary statement of issues. This is a continuous process. Be prepared to re-frame the issue(s) as your research progresses. Familiarize yourself with the court structure of the jurisdiction. It may be necessary to do background research to determine whether provincial or federal law applies. Conduct background research to get an overview of the subject area, identify issues and terms, and get clues to primary sources. Learn the types of authority involved, i.e. whether the issues are governed by case law, statutory law, administrative law or a combination. You may need to learn some of the “black letter law” to gain a context for your research. Secondary sources can be useful for this purpose. Search for legal authority using appropriate methods of updating. There are many different techniques for finding primary authorities. For any given research project, some will work better than others. Using a variety of tools will ensure comprehensive research and compensate for difficulties that one may encounter in using particular sources. Always look for pocket parts and other supplements when using print sources. Note the dates of coverage in all electronic sources consulted. Read and evaluate primary authorities. Never overlook the importance of reading cases and other authorities as you go along. Do not substitute reading of the headnotes, synopses or interpretations in secondary sources for your own thoughtful reading of the authorities you find. Look for holdings of cases, not just broad statements of the law. Make sure cases are still good law and you have the current version of statutes. Time can often be saved by using case validation tools (citators) as soon as you read a case and determine that it is relevant to your issue. Make sure you have checked all available supplements if using print sources. Look up statutes in electronic form to check for recent amendments. Refine analysis and formulate conclusion. Returning to secondary sources near the end of a research project can be helpful. These sources can be easier to understand after you have read some of the primary authorities. 24 Quelles sont les lois pertinentes? 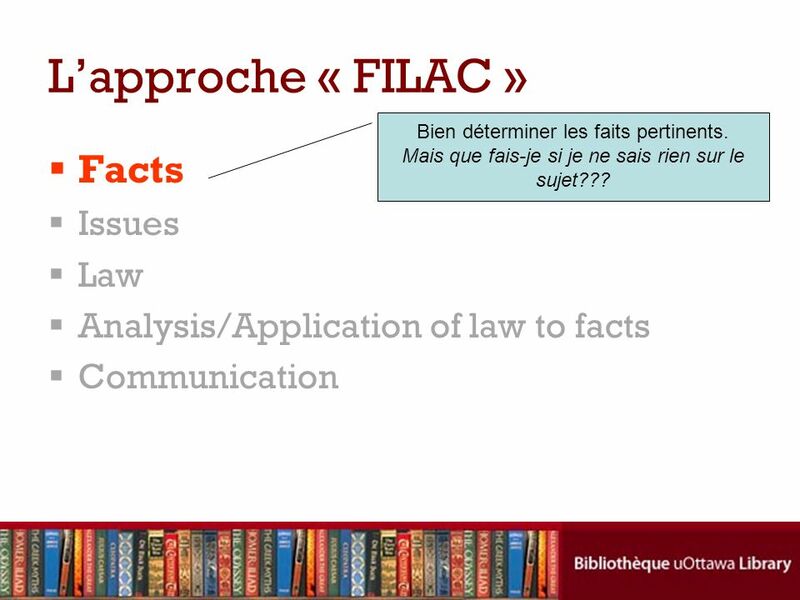 L’approche « FILAC » Facts Issues Law Analysis/Application of law to facts Communication Quelles sont les lois pertinentes? 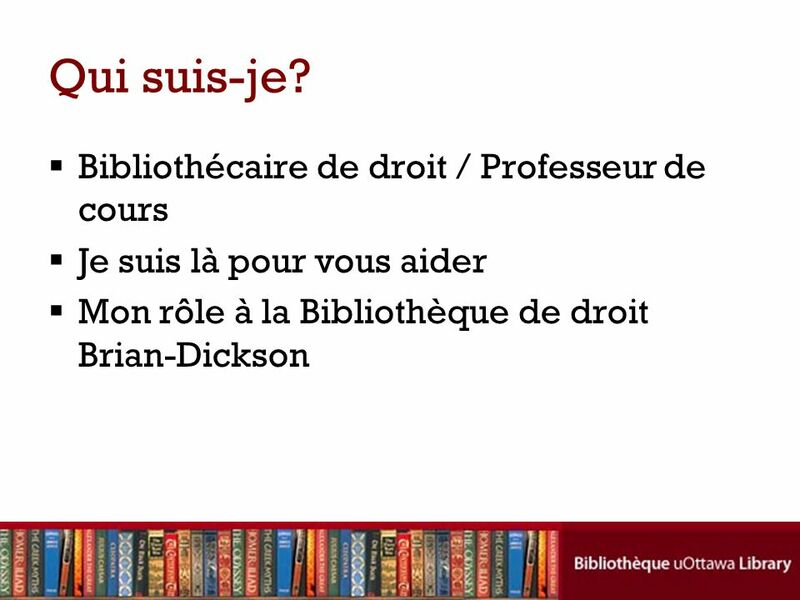 Consultez des sources secondaires pour un aperçu du sujet. Déterminez les sources primaires. Based on the first letter of each of the steps; as described by Maureen Fitzgerald in Legal Problem Solving: Reasoning, Research and Writing, 3d ed. (Toronto: Butterworths, 2004) at 2-4. A similar legal research model: Analyze the facts and formulate a preliminary statement of issues. This is a continuous process. Be prepared to re-frame the issue(s) as your research progresses. Familiarize yourself with the court structure of the jurisdiction. It may be necessary to do background research to determine whether provincial or federal law applies. Conduct background research to get an overview of the subject area, identify issues and terms, and get clues to primary sources. Learn the types of authority involved, i.e. whether the issues are governed by case law, statutory law, administrative law or a combination. You may need to learn some of the “black letter law” to gain a context for your research. Secondary sources can be useful for this purpose. Search for legal authority using appropriate methods of updating. There are many different techniques for finding primary authorities. For any given research project, some will work better than others. 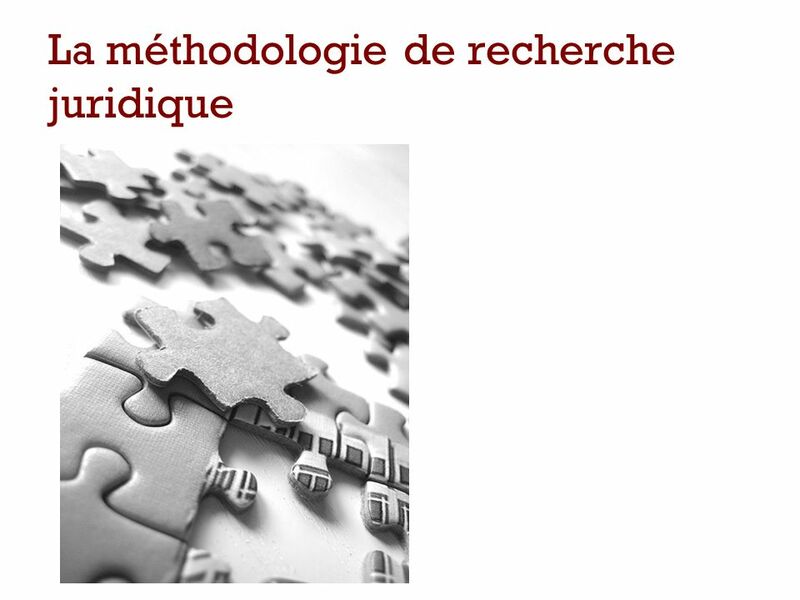 Using a variety of tools will ensure comprehensive research and compensate for difficulties that one may encounter in using particular sources. Always look for pocket parts and other supplements when using print sources. Note the dates of coverage in all electronic sources consulted. Read and evaluate primary authorities. Never overlook the importance of reading cases and other authorities as you go along. Do not substitute reading of the headnotes, synopses or interpretations in secondary sources for your own thoughtful reading of the authorities you find. Look for holdings of cases, not just broad statements of the law. Make sure cases are still good law and you have the current version of statutes. Time can often be saved by using case validation tools (citators) as soon as you read a case and determine that it is relevant to your issue. Make sure you have checked all available supplements if using print sources. Look up statutes in electronic form to check for recent amendments. Refine analysis and formulate conclusion. Returning to secondary sources near the end of a research project can be helpful. These sources can be easier to understand after you have read some of the primary authorities. 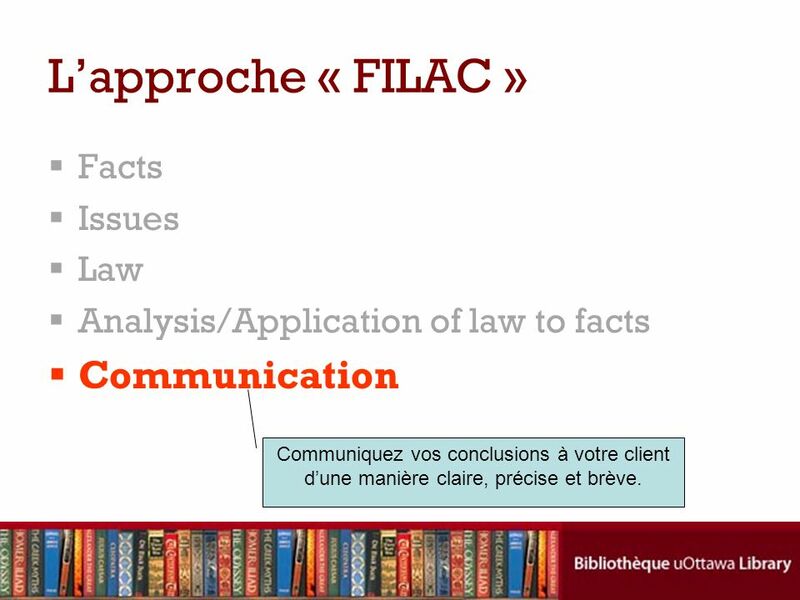 Communication De la même manière dont un juge le ferait, analysez les faits à l’égard des lois ou principes de droit applicables. Based on the first letter of each of the steps; as described by Maureen Fitzgerald in Legal Problem Solving: Reasoning, Research and Writing, 3d ed. (Toronto: Butterworths, 2004) at 2-4. 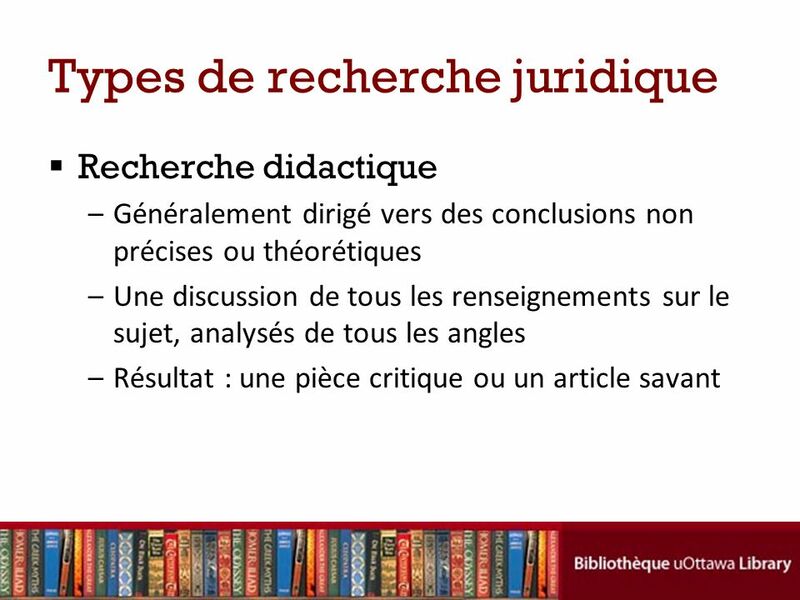 A similar legal research model: Analyze the facts and formulate a preliminary statement of issues. This is a continuous process. Be prepared to re-frame the issue(s) as your research progresses. Familiarize yourself with the court structure of the jurisdiction. It may be necessary to do background research to determine whether provincial or federal law applies. Conduct background research to get an overview of the subject area, identify issues and terms, and get clues to primary sources. Learn the types of authority involved, i.e. whether the issues are governed by case law, statutory law, administrative law or a combination. 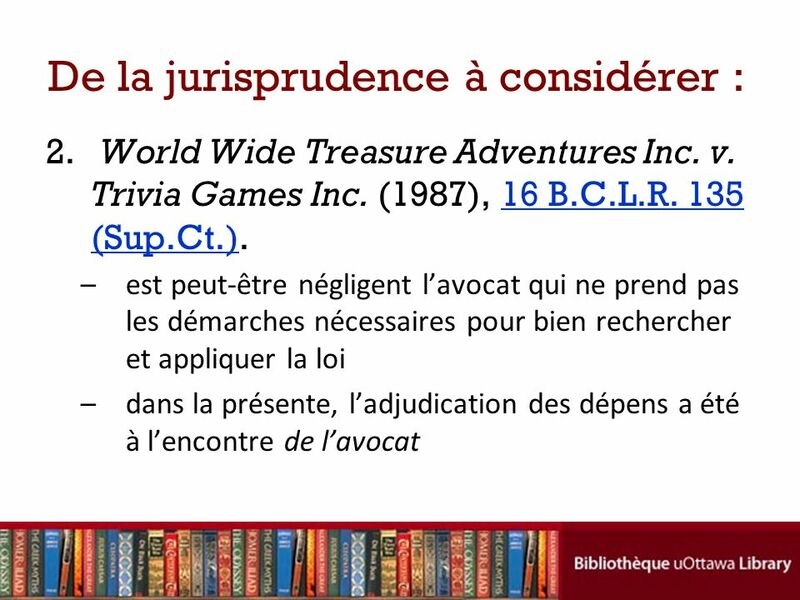 You may need to learn some of the “black letter law” to gain a context for your research. Secondary sources can be useful for this purpose. Search for legal authority using appropriate methods of updating. There are many different techniques for finding primary authorities. For any given research project, some will work better than others. Using a variety of tools will ensure comprehensive research and compensate for difficulties that one may encounter in using particular sources. Always look for pocket parts and other supplements when using print sources. Note the dates of coverage in all electronic sources consulted. Read and evaluate primary authorities. Never overlook the importance of reading cases and other authorities as you go along. Do not substitute reading of the headnotes, synopses or interpretations in secondary sources for your own thoughtful reading of the authorities you find. Look for holdings of cases, not just broad statements of the law. Make sure cases are still good law and you have the current version of statutes. Time can often be saved by using case validation tools (citators) as soon as you read a case and determine that it is relevant to your issue. Make sure you have checked all available supplements if using print sources. Look up statutes in electronic form to check for recent amendments. Refine analysis and formulate conclusion. Returning to secondary sources near the end of a research project can be helpful. These sources can be easier to understand after you have read some of the primary authorities. Analysis/Application of law to facts Communication Based on the first letter of each of the steps; as described by Maureen Fitzgerald in Legal Problem Solving: Reasoning, Research and Writing, 3d ed. (Toronto: Butterworths, 2004) at 2-4. 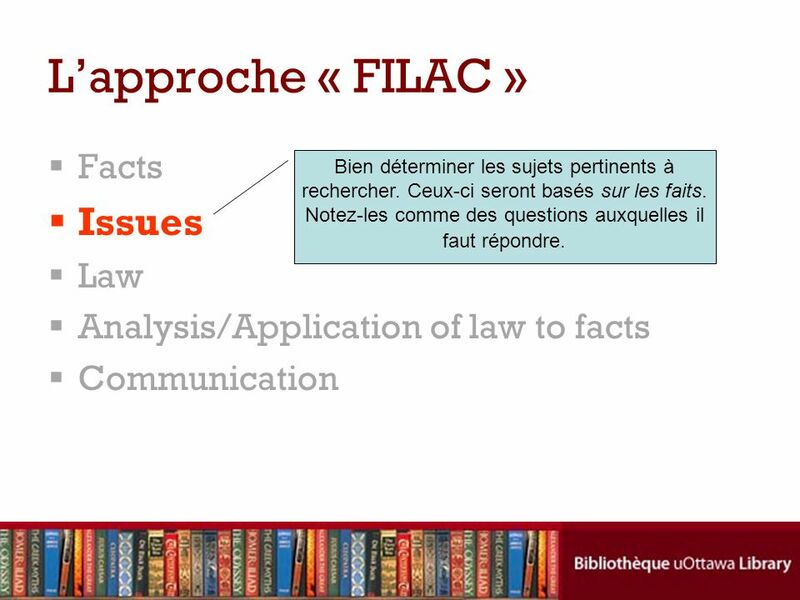 A similar legal research model: Analyze the facts and formulate a preliminary statement of issues. This is a continuous process. Be prepared to re-frame the issue(s) as your research progresses. Familiarize yourself with the court structure of the jurisdiction. It may be necessary to do background research to determine whether provincial or federal law applies. Conduct background research to get an overview of the subject area, identify issues and terms, and get clues to primary sources. Learn the types of authority involved, i.e. whether the issues are governed by case law, statutory law, administrative law or a combination. You may need to learn some of the “black letter law” to gain a context for your research. Secondary sources can be useful for this purpose. Search for legal authority using appropriate methods of updating. There are many different techniques for finding primary authorities. For any given research project, some will work better than others. Using a variety of tools will ensure comprehensive research and compensate for difficulties that one may encounter in using particular sources. Always look for pocket parts and other supplements when using print sources. Note the dates of coverage in all electronic sources consulted. Read and evaluate primary authorities. Never overlook the importance of reading cases and other authorities as you go along. Do not substitute reading of the headnotes, synopses or interpretations in secondary sources for your own thoughtful reading of the authorities you find. Look for holdings of cases, not just broad statements of the law. Make sure cases are still good law and you have the current version of statutes. Time can often be saved by using case validation tools (citators) as soon as you read a case and determine that it is relevant to your issue. Make sure you have checked all available supplements if using print sources. Look up statutes in electronic form to check for recent amendments. Refine analysis and formulate conclusion. Returning to secondary sources near the end of a research project can be helpful. These sources can be easier to understand after you have read some of the primary authorities. 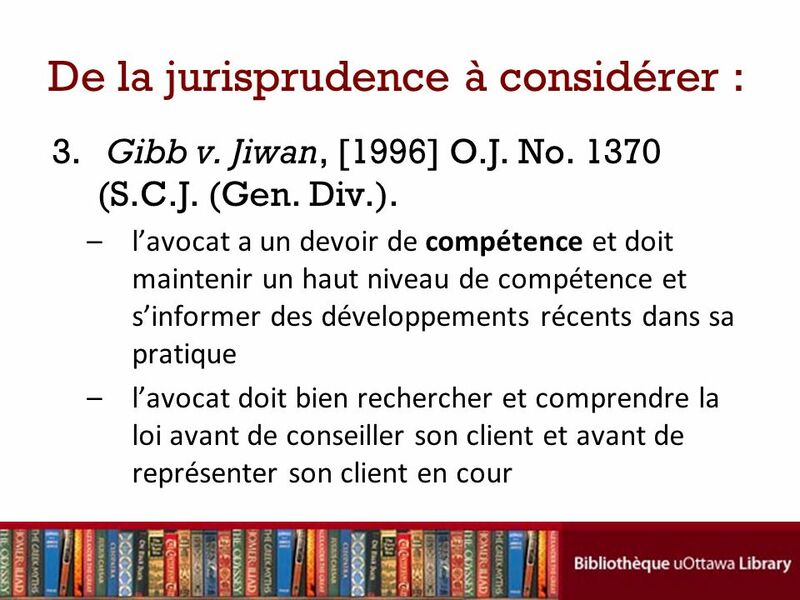 Communiquez vos conclusions à votre client d’une manière claire, précise et brève. 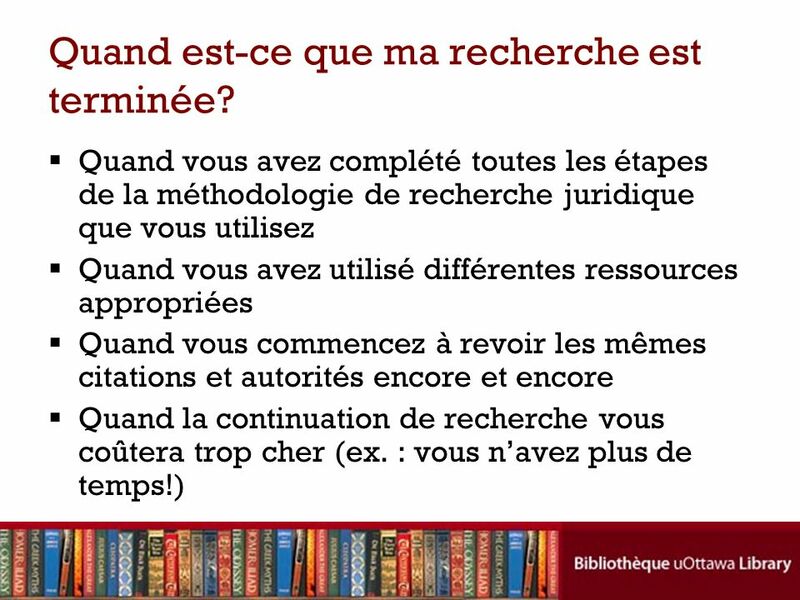 27 Quand est-ce que ma recherche est terminée? 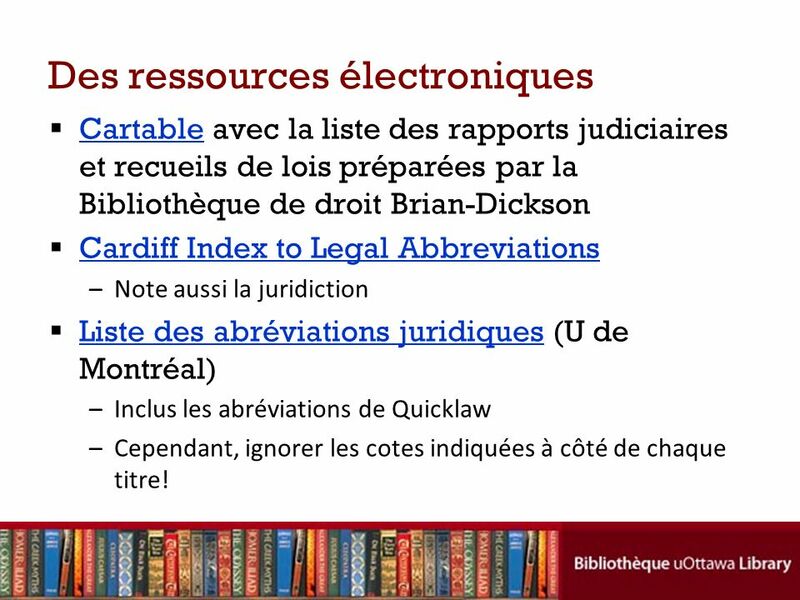 Cartable avec la liste des rapports judiciaires et recueils de lois préparées par la Bibliothèque de droit Brian-Dickson Cardiff Index to Legal Abbreviations Note aussi la juridiction Liste des abréviations juridiques (U de Montréal) Inclus les abréviations de Quicklaw Cependant, ignorer les cotes indiquées à côté de chaque titre! 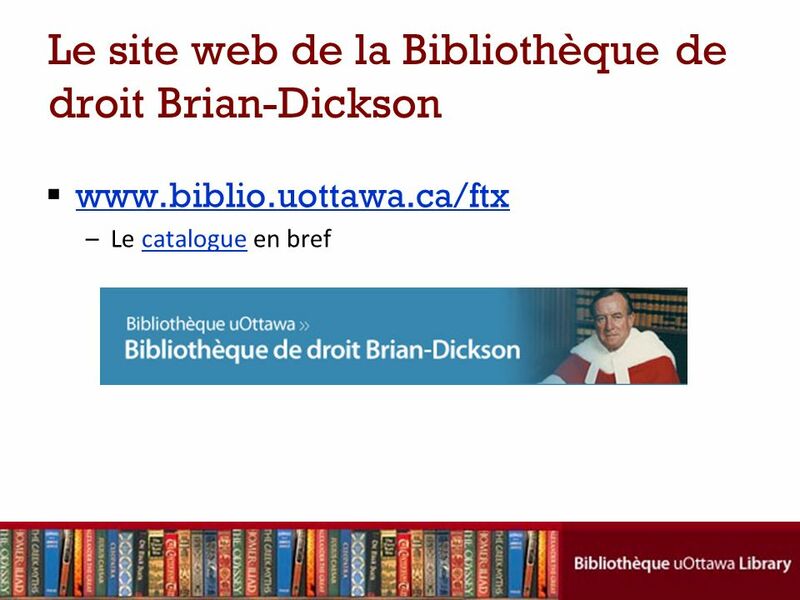 Brian Dickson Law Library binder: only covers law reports and statutes, NOT journals About the Cardiff Index to Legal Abbreviations Legal abbreviations can be a puzzle to both new students and experienced professionals. 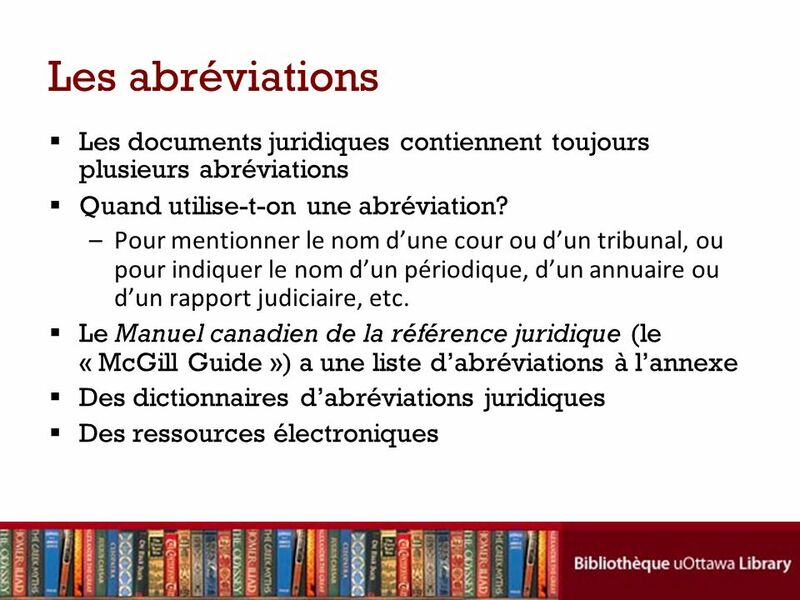 This web-based service allows you to search for the meaning of abbreviations for English language legal publications, from the British Isles, the Commonwealth and the United States, including those covering international and comparative law. A wide selection of major foreign language law publications is also included. Publications from over 295 jurisdictions are featured in the Index. 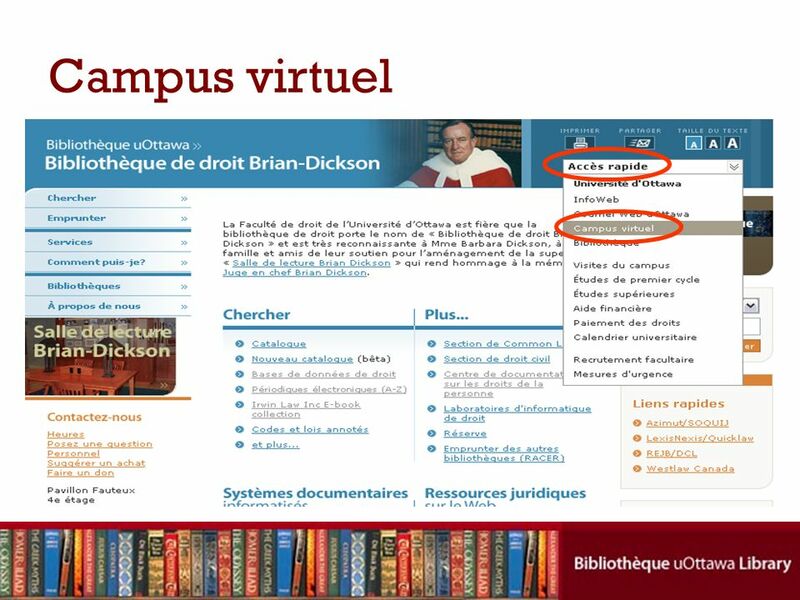 The database mainly covers law reports and law periodicals, but some legislative publications and major textbooks are also included. 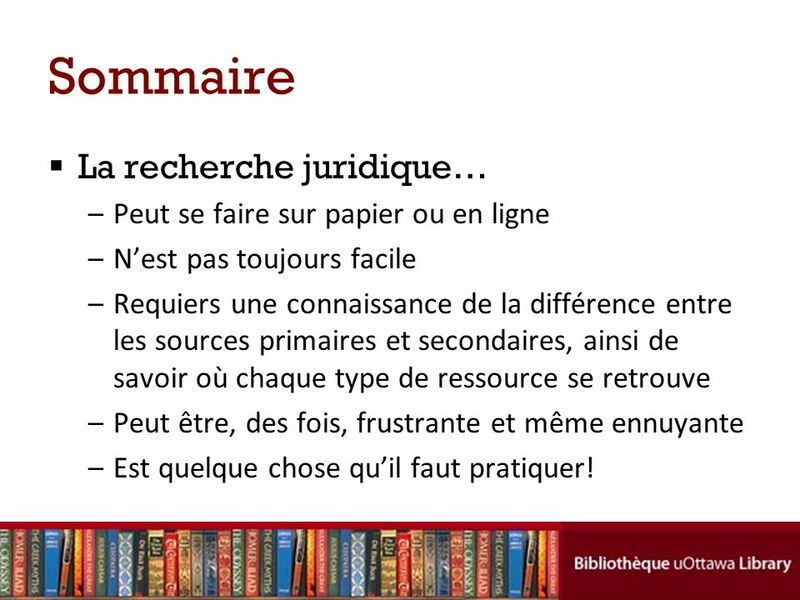 N’est pas toujours facile Requiers une connaissance de la différence entre les sources primaires et secondaires, ainsi de savoir où chaque type de ressource se retrouve Peut être, des fois, frustrante et même ennuyante Est quelque chose qu’il faut pratiquer! 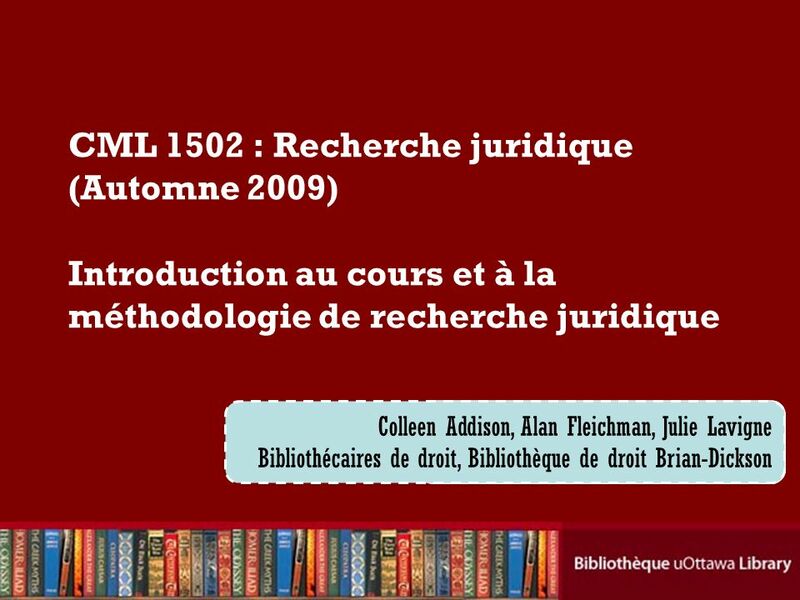 Télécharger ppt "CML 1502 : Recherche juridique (Automne 2009) Introduction au cours et à la méthodologie de recherche juridique Colleen Addison, Alan Fleichman, Julie." UNTE 101 2e partie Isabelle Lorrain, MSI 28 septembre 2004 Bibliothèque Saint-Jean.